We have a toy poodle named Ola, which means Hello in Spanish. She’s my first dog and everyone in the family loves her like our own baby. In August 2016, Ola was admitted to A&E because of a spare rib treat we fed. Ola mama's carelessness and oversight led to a slightly ruptured intestine and when the vet retrieved the bone shard from her body, I broke down and cried on the spot. This happened right under my watch. Nowadays, I will gently turn away bone treats if friends and family offer to buy it for my dogs. Instead, we learned to experiment & dehydrate raw meat as treats instead since they are supposed to contain naturally occurring enzymes that help protect their teeth and gums. It also does not contain unnatural and damaging starches and sugars that promote unhealthy bacterial growth in the mouth, which leads to smelly breathe. ​Commercial brands may be good but expensive, so we’ve been making our own treats and sharing them with our friends. Their furkids loved it! That got us thinking: why not share our love further in a more economical way? So here you go – Ola’s Favourites treats is born. So.. Ola healed well and formed her own little black family after that! And yes, Ola’s Favorites treats are all tasted and given all paws  up by our very own orhlulus (means: black) family! 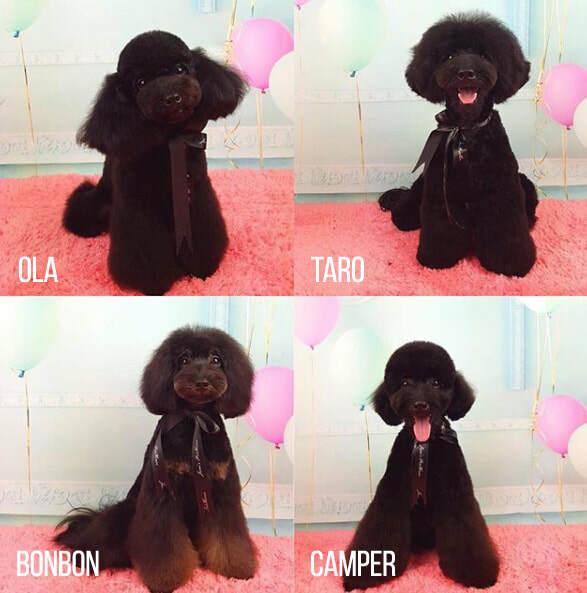 Clockwise from left: Ola (mama), Taro (papa), Camper (younger bro), Bonbon (elder sis).